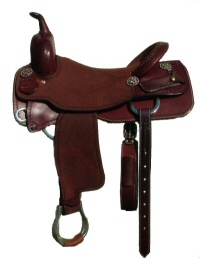 Koen Saddle Shop specializes in custom cutting and reining saddles. We have all the most desirable features, handcrafted just for you at a reasonable price. We take custom orders, but always have a selection of nice saddles on hand. Browse our site, and when you find something you like, just give us a call! We don't take internet orders because we enjoy talking with our clients and meeting their needs personally. Koen Saddles are ready to ride as soon as they arrive. All saddles come fully complete with your choice of neoprene or mohair girth, flank cinch, billets and your choice of stirrups. Koen's saddles are available rigged with a true close contact system invented by Chet Koen and not available anywhere else. Heavy, real sheep skin lining on each saddle..
We use only the the finest, first quality leather for every saddle. Pre-turned flexible fenders for comfort, that also move far forward and back for extra freedom of movement.